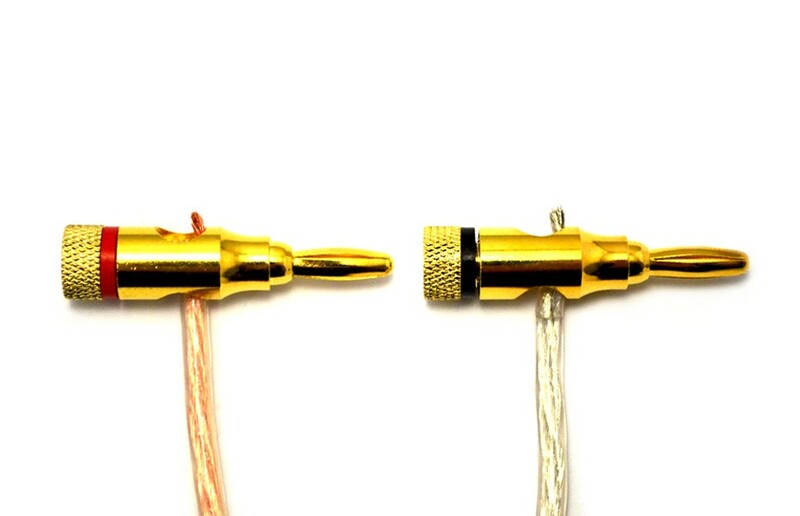 Banana plugs make speaker installation a breeze. 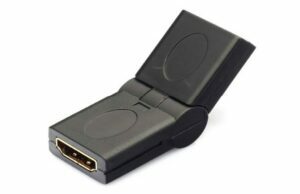 No more worrying about stray strands shorting across terminals and overloading your equipment. 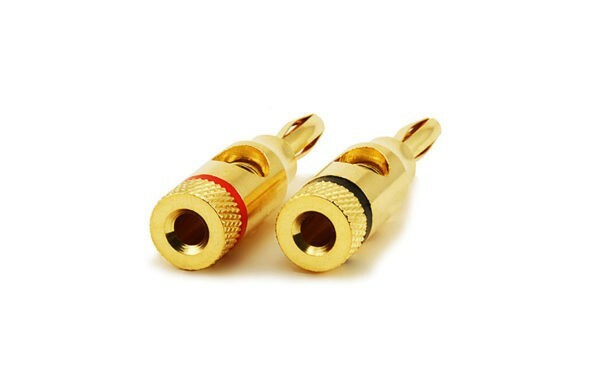 These sturdy plugs look nice and provide a solid contact. 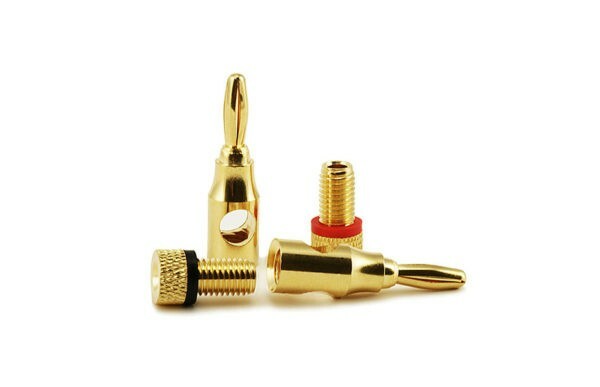 High quality, gold plated, banana plugs. – Can accept bare wire, spades or other banana plugs. 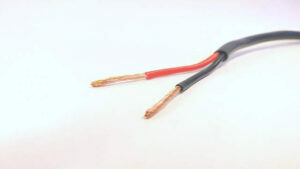 – Can accept 18 to 12 AWG speaker wires. – Color coded black/red rings for maintaining proper polarity. – Secure, positive contact with binding posts. – Construction: Copper body and tip base. Ferromanganese Tip. All gold plated. 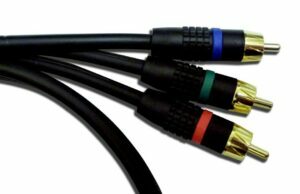 – Acceptable Gauges: 18AWG to 12AWG. Question: What is the benefit of banana plugs? Are they better than bare wire. Answer: Banana plugs offer solid connection and convenience. 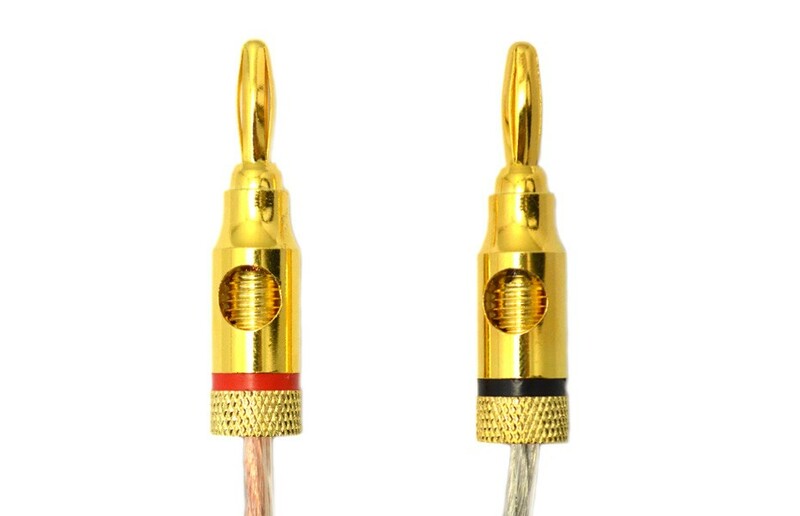 When trying to wire speaker cables into the back of a reciever in a cabinet or other tight space, banana plugs offer the convenience of connecting the bare wire out in the open and simply plugging them in the appropriate post. 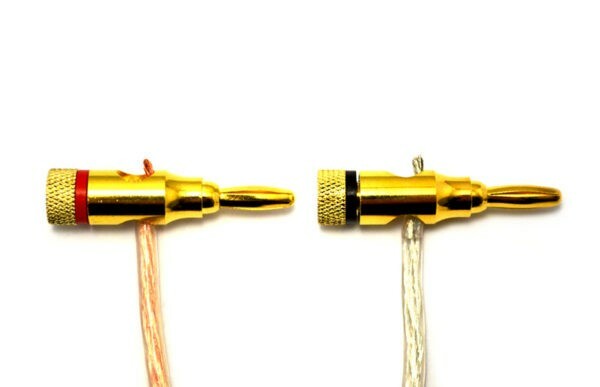 This also prevents cross termination of stray strands that can overload the system. 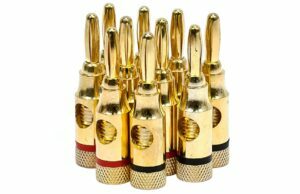 Additionally, the gold plating on the plugs offer corrosion resistance. Corrosion (oxydation) can impede signal transfer and can potentially damage the terminals on your equipment. So banana plugs offer convenience, safety and equipment protection. Copper is a better conductor of electricity than gold but is much more susceptible to corrosion. Question: What's the difference between the Closed Screw Type and the Open Screw Type. Answer: The Open Screw type has the benefit of being a little more versatile. The side entry option means it can accomodate thicker gauges of wire or bundles of more than one conduit. 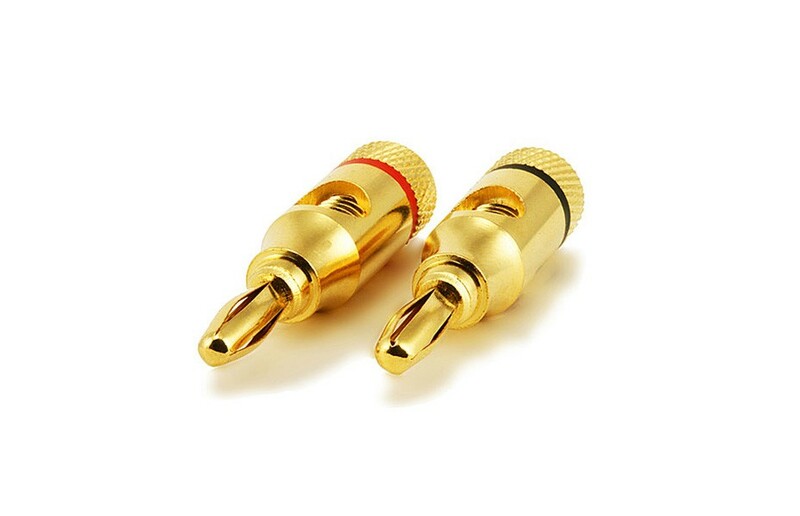 It can also piggy back other connectors while terminating bare wire at the same time. The Closed Screw type has the benefit of providing a cleaner finish. 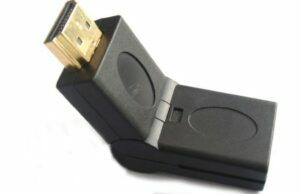 Because there is no hole in the side, there are no exposed strands of wires. This also reduces the chances of shorting across terminals.